“Living in Bermuda, we may not realise the extent to which our lives are impacted by the Monsanto Corporation,” BEST said. “While we may not have GMO crops in Bermuda, we import much of our food from the U.S. where they do have GMO crops, and which are then used to produce many packaged food items that we buy and consume. 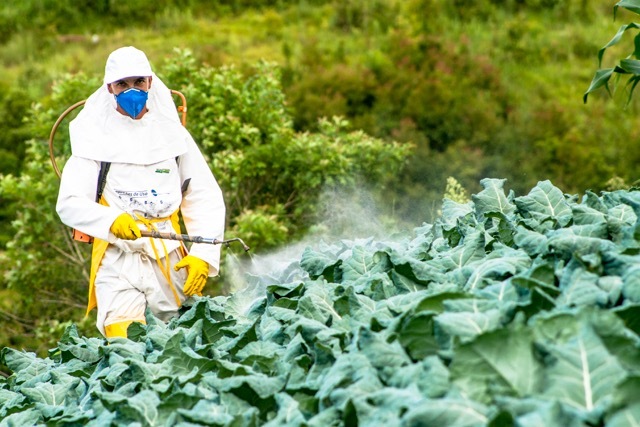 “In Bermuda, the name ‘Monsanto’ may be most known as the maker of the pesticide RoundUp; a pesticide which contains glyphosate, a chemical deemed by the World Health Organisation to be a probable carcinogen. “The term ‘probable’ is used because testing of RoundUp cannot be done on human beings [but causes tumours in lab rats]. In this context, ‘probable’ means likely… not just possible. Health concerns are even greater now that RoundUp is also being used [in the] days before the harvesting of wheat, increasing the concentration in food products. “Monsanto is a publicly-traded, multinational, agrochemical and agricultural biotechnology corporation, whose shareholders make money while the food supply is being poisoned. See more about Monsanto’s toxic legacy here. BEST said, “So what can we do? Join our event, Bermuda’s Virtual March Against Monsanto on our BEST Facebook page. Update May 19, 10.34pm: An email from the Monsanto said, “The more than 20,000 people of Monsanto are committed to having an open dialogue about modern agriculture and how food is grown as we focus on using digital tools, data and research to find solutions that balance the need to feed people and protect the planet – we’re proud of the work we do, and we’re eager for people to know more about us. Not sure what exactly you’re protesting here. Almost all foods are in some way genetically modified, whether it’s the cow producing your milk or the carrots grown in your yard. Genetic modification has always involved the selection of, and breeding for, characteristics you want and hoping a random combination of genes in the offspring develops those characteristics in a positive way for you. It’s a slow method with a high risk of error. Thanks to science we now have a way of precisely inserting the genes we want in the places we want them. It’s no longer left to random chance. It’s actually a safer, more effective way of getting the characteristics you want. And Bermudians especially should be very, very thankful for GMO organisms. After all that’s where the insulin needed by diabetics come from – genetically modified yeast cells. If you’re protesting the excessive use of pesticides and herbicides, that’s something totally different. The genetic modification of certain plants to be more tolerant of certain pesticides has encouraged the overuse of those pesticides. This is NOT a GMO issue. Anyway, I’ll support BEST’s virtual march with my virtual donation. I think the GMO bit is more to invoke a greater reaction since many people fear the term blindly and “GMO-free” is a hot marketing ploy. We’ve been modifying plant and animals for millennia. But I agree with the sentiment, Monsanto is an evil corporation. Isn’t a core principle of food security food productivity and the ability to meet ever increasing demand? What is fundamentally wrong with GMO crops?